One of the very first purchases that all new parents must make is baby car seat. In the UK, all children under three years of age must be properly restrained in an appropriate car seat, whether they are travelling in the front or backseat of the car. The only exception to this rule is when riding in a licensed taxi or licensed hire car, although parents should make every effort to provide a car seat when transporting babies and young children by these means. Car seats provide a measure of safety for young passengers that is simply not possible without their use and safe travel is a concern for every parent. When purchasing a car seat you must make sure that it fits correctly in your car and any car that it will be used in. There is no point buying the best car seat around with all the seafety features you can imagine if it doesn't fit. Buy your car seat from a reputable company or baby store as they will have qualififed staff that will check the car seat is compatible with your car, and will also be able to fit it for you. Finally before you leave the store ensure you know how to correctly fit the car seat. For children up to three years old, a correct child restraint must be used, in both the front seat and back seat of a vehicle. Rear facing child restraints are not permitted for use in the front seat of a vehicle with an active front airbag. In a licensed taxi, a child may ride unrestrained if no child restraint is available. For children from three years old and up to 1.35m or up to 12 years old, the correct child restraints must be used in the front seat and also in the back seat, if seat belts are available. This means that all children under 1.35m or under 12 years old must use a booster seat with an adult seat belt. Travelling in a licensed taxi or licensed hire car. A child unexpectedly needs to be transported only a short distance. There are already two child restraints being used in the back seat, not allowing for the use of a third. Adult seat belts must be worn while riding in either the front or the back seat of a vehicle, if seat belts are available. While the law makes room for exceptions to the necessary use of child restraints, common sense dictates that parents must make it a priority to transport their babies and young children in the safest possible manner. Statistics confirm that the injury and death rates of children who are properly restrained when an accident occurs are much lower than those of unrestrained children. For this reason, it is vital that all babies and children travel only when secured with correct restraints. While baby car seats may vary quite a bit when it comes to style and extra features, such as drink holders and book pockets, the most important factor to consider when choosing a car seat is safety. Manufacturers are always looking for ways to improve the safety of their baby and child car seats, so this is one item that may be best bought new, rather than accepting an offer of a loan from a friend whose child has outgrown their car seat. If you do use an older car seat, be sure to do a quick check to be sure that it has not been recalled by the manufacturer. 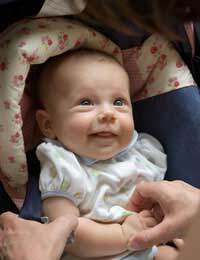 A good car seat is one of your baby's most important pieces of equipment -- after all, it holds precious cargo.